Return to the hamlet of Loch-Durnan where an ancient evil struggles to rise again. The heroes are asked to come back and aid the hamlet one more time. What manner of mysterious evil can be causing the terrible attacks in the region? Why has the Witch of Loch-Durnan called out for assistance and why has the church taken a sudden, extreme interest in the sleeply hamlet? 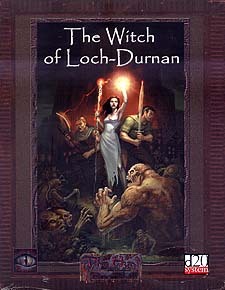 In this sequel to the award nominated Pit of Loch-Durnan the players find themselves once again thrust into intrigue and evil. Designed for four player characters ranging from 5th to 7th level, this adventure can be used to continue the story from the Pit or as a stand alone. Use it as part of The Hunt: Rise of Evil setting or to add a dark twist to your own d20 fantasy campaign. In this large 72 page adventure you will find a rich plot, a massive battle, an entirely new class of creature and an innovative mutant generator. Requires the use of Dungeons & Dragons Player's Handbook, Third Edition.